Implant Dentistry is on the cutting edge of dentistry in procedures and technology involved in replacing missing teeth. Dental implants are quickly supplanting dentures and are a great alternative for good candidates. If you are missing any teeth, it is very important to your overall dental health to have them replaced quickly. Replacements will help maintain the placement and health of surrounding teeth and allow them all to function properly. A Dental Implant is a synthetic device that is placed at the root location and is anchored to the jawbone or metal framework on the bone. It serves as a foundation for artificial teeth replacements, bridges, and even dentures. Using materials such as ceramic or metal, implants are carefully designed and colored to give you the look and feel of your natural teeth. As such, Teeth Whitening is often recommended BEFORE getting an implant. Good candidates for dental implants must have proper bone density and a strong immune system. A minor surgical procedure is required to place the implant and followed by a period of time for bone tissue to grow around and anchor the device. Maintaining great oral hygiene is very important to ensure the health of your implant and surrounding tissue, and helps ensure your implant lasts a long time. 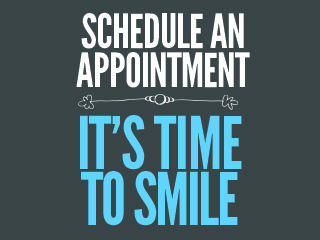 Schedule a consultation today to see if you are a good candidate for dental implants. Crowns – When teeth are badly broken, extensively decayed, or in need of replacing existing caps, crowns are the treatment of choice. Porcelain crowns and fillings give a natural look and feel to your restoration. Bridges – A bridge is a restoration that replaces one or more missing teeth. Crowns are used on the teeth in front of and behind the missing tooth to support the restoration. Implant Dentures – An “over-denture” can connect to implants inserted into the jawbone. The implants have extensions which connect to attachments on the denture which help hold it securely in place for eating and speaking, but does still allow for easy self-removal for cleaning purposes.